That was a fun read! And his narrating skills are excellent. 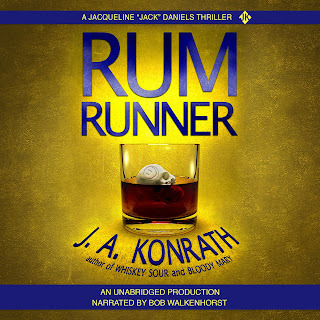 Did he study up on it after you asked him to narrate Rum Runner? Because he sounds like he's done it a thousand times. I'm really impressed. And yay for great music to listen to! Long Gone Long is going to be a favorite. Bob listened to many audiobooks before giving this a go. Since he's also a recording artist, he really paid a lot of attention to how the book sounds; in a car, with headphones, on speakers, etc. I couldn't be happier with the final product. I'm going back and forth on whether or not to take the dive into audio. Amazon and other companies are putting a lot of money towards programs and devices that read out loud, and I'm sure that in a few years, something will be available that can do nearly as well as a human can... Different voices and everything. The cost and amount of time it takes an actual human to produce an audiobook makes me wonder if human narrators will become obsolete. Will I be better off waiting and putting that money elsewhere? On the other hand, audiobooks are super hot right now, and I know I'm missing out on a huge audience. I'd love to hear what other authors think. Wait for technology to catch up or dive in now? If money weren't an issue (we're saving up to build a house), we'd dive in now. But our money is slotted for other things as soon as it comes in. This is the best story I've heard in a long time - what a ride! I do in fact live in the KC area, so I'll keep an eye out for his gigs. Man has been making music as long as I've been alive, and he's still writing new songs? Respect. That's the kind of person I want to be. Thanks again for your valued inputs, Joe. Reading travels through your eyes as a music crazed youth into today as mentor to us all, priceless. It's next phase for add-on profits for us in your fan club. Must learn more. Did anyone ever tell you that you're good at telling a story, Joe? Thanks for sharing this; it's more inspiration for me to finally get into audio myself. Thanks for sharing that cool story. I agree, Joe. IMO this is the best audio-book ever. All others will have to up their game to match it. @ Anon. Bob is a rock star. He's got everything he needs in his home to record, and brought a mic, sound board, and digital recorder over to my house to capture the McGlade scenes. @ Andrea - You can make deals on ACX to split royalties with narrators rather than pay them, so the only upfront cost is cover art, and even then some people just stretch their Amazon book cover into a square. Great post Joe. 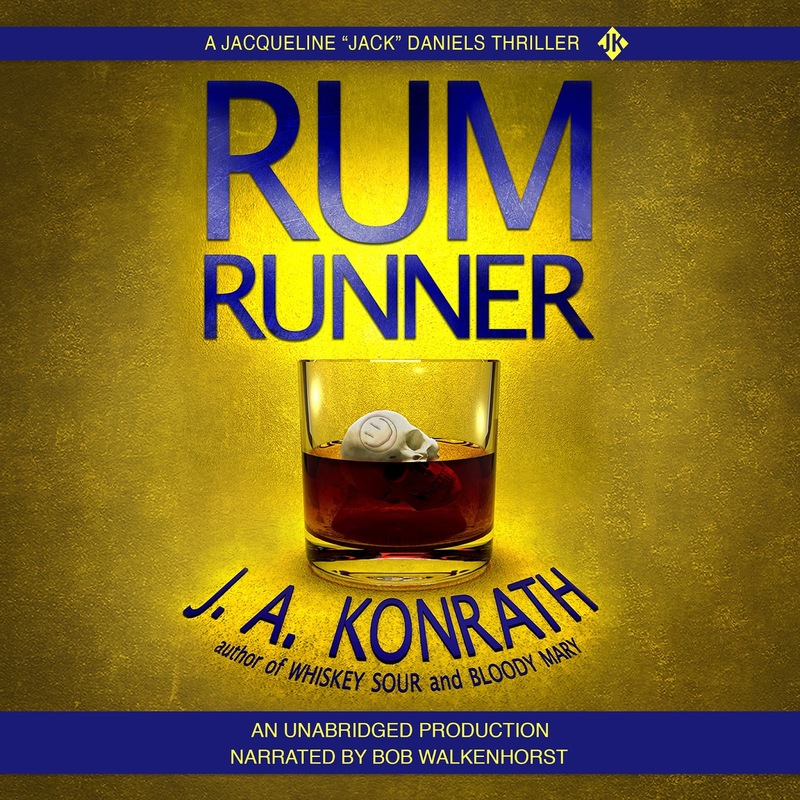 I'm picking up my audio RUM RUNNER tomorrow and will listen this weekend. Have a great Memorial day, and drink to much! I've used ACX for about a dozen books now, and it's turned out great. I prefer to pay the producer/narrator up front, so it takes a while to get my money back, but in the long run, it's been the best choice for me. Added benefit is that my audiobook sales always jump after I've had a BookBub ad. This is funny because for my next series I'm selling the audiobook rights. I got offers for my first series but turned them down. In fact the reason I decided to do audiobooks in the first place was because I got two offers for the rights a week apart and decided to self-pub it. They're all in profit but it hasn't been as lucrative as I had hoped, though to be honest I've done exactly zero marking for it. I think if I had sold the rights I would have made twice as much -- the advance and royalties. I'd love to hear about your results in 6 months or so from now, Joe -- between the self-pub audio and the ones you sold the rights to in terms of revenue. Audible was one of those companies that asked to buy the rights and they don't come any bigger. Heck, they OWN Audible.com, so you can imagine how easier/better/more effective they could have pushed the series. Very cool story, Joe. It's remarkable how occurrences from our youth can sometimes come around and enrich our lives so many years later. I never noticed you mention selling audio rights to Brilliance Audio before. How does that work? I did go to the ACX site, but could not figure out how to create an audio book online. I pounded on my keys and nothing would happen. It's impossible to find someone to talk to at ACX if you're computer challenged. Walter I've used ACX twice with great results. Normally what you do is create a profile and then you search for audiobook producers who might fit your project. You send them a request with the profile of your book project. They accept or deny it. You can either go 50/50 on the royalties or you can pay the producer up front. I've gone 50/50 with my great audiobook producer Bryant Sullivan. He produced The OzValt Grant Collection and its prequel Acorpsepile with great results. Good luck! Great work, Joe. Maybe at some point you could write an article on all the practical points of how you did this, including the economics of it, the royalty structure, how to upload it, etc. Is this something self-published authors can do on the cheap, or does it take considerable money to produce a salable product? I lasted 6 weeks, and was left with a lingering hatred of people who insist on asking for fries with no salt. Wow. This is an awesome story - I couldn't stop reading. Love how such a random connection turned into something beautiful and wonderful. And it's a perfect example of selling a product through a story. Thank you, I just learned a LOT. I'm new to your site, and I really enjoyed this post. A great trip down memory lane... I'm talking about the 80s. "I grew up when John Hughes was making movies for my age group, and he was correct that the music you listened to in high school imprinted on you strongly." This is so true. Music got me through the tough times, and I still listen to those artists today. Thanks for discussing your audio experience. Audio is an expensive route to go. Glad to see it worked out for you through the years... and through the friendship. I'm getting ready to plunge into audio. I'd be interested in hearing how others feel about the 50/50 split with narrators vs. the upfront payment. It seems like a lot of work for narrators with no guarantee of profit, so it seems that if you go that route, you're not going to get the best talent....more likely someone looking to break in. Some of the audiobooks of self-pubbed authors sound like they're narrated by bad community theatre actors. OTOH, my most popular book is about 100K words, which I think would require a $2-3K payment if I went the upfront route. Any thoughts on which is best? I've had several successful BookBub promos, so I do have an audience. I loved The Rainmakers back in the day. My favorite song was "The Wages Of Sin," I think. Thanks for the memory!